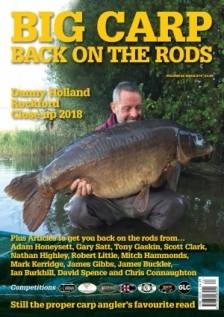 The Royal Forty swam 'off the carp anglers radar' , right under the noses of the best carp anglers of the 1990's in its London Park home for many years until it was discovered. In fact even after it was caught initially its home was kept a close guarded secret. It wasn't until Big Carp Legend Ritchie Mc Donald got on its trail and landed this incredible fish that it was finally put on the map. Terry Hearn couldn't wait to tick this one off his list and sacrificed a season on the Car Park lake, and the capture of Aufur as it turned out, to be one of the few who had held the queen of Richmond Park a venue which at the time was 'well off the beaten track ' with no night fishing! !.....truly a legendary carp of our era. Others in the series include: Bazil, Heather, The Black Mirror, The Burghfield Common, The Bishop, Mary and Mary's Mate.